The theme for this week’s combined Weekend Cat Blogging and Photo Hunt is ORANGE. So here is a series of photos in which Luna encounters our large stuffed fish, appropriately named “Big Fishy”. For the last couple of years, Big Fishy has mostly been in the closet (no pun intended). But we took the opportunity to bring him out for this week’s theme. 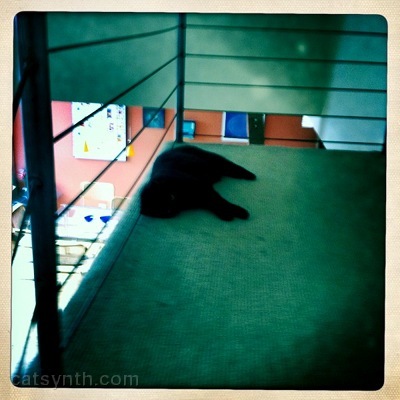 It may not be the most seasonal interpretation of orange, but we do have a black cat. It also occurs to me that yesterday’s photo also fits today’s orange theme. Weekend Cat Blogging #281 is hosted by Nikita and Elivra at Meowsing of an Opinionated Pussycat. Check out their latest “street scenes” of cats from their neighborhood in southern California. 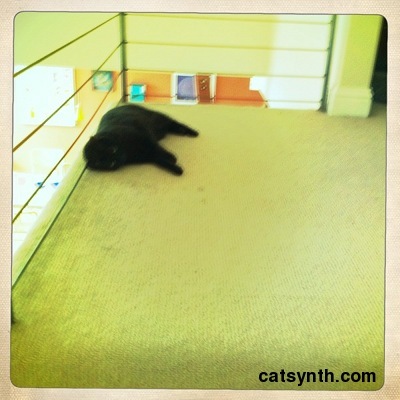 And the Weekend Cat Blogging Hallowe’en Edition will be hosted right here at CatSynth next weekend! Photo Hunt #236 is hosted by tnchick. This week’s theme is orange. The Carnival of the Cats is hosted by Kashim, Othello and Salome. For Weekend Cat Blogging #271, we put aside the “big camera” and present some images of Luna all taken with our new iPhone 4. This was taken with the Hipstamatic app. It emulates the classic Hipstamtic camera, including various lens and film options. This was taken with a Kaimal Mark II lens (not sure how it got an Indian name). It tends to give the image an overall orange tinge, and thus we squeeze into this week’s Photo Hunt theme of Orange. Yes, Luna is very much a cat. I quite like the look in her eyes at the end. Weekend Cat Blogging #271 is hosted by LB and Breadchick at The Sour Dough, where they are enjoying lots of relaxation, and a bit of golf and baking. Photo Hunt #226 is hosted by tnchick. This week’s theme is Orange. Carnival of the Cats will be up this Sunday at When Cats Attack!.